P1185. 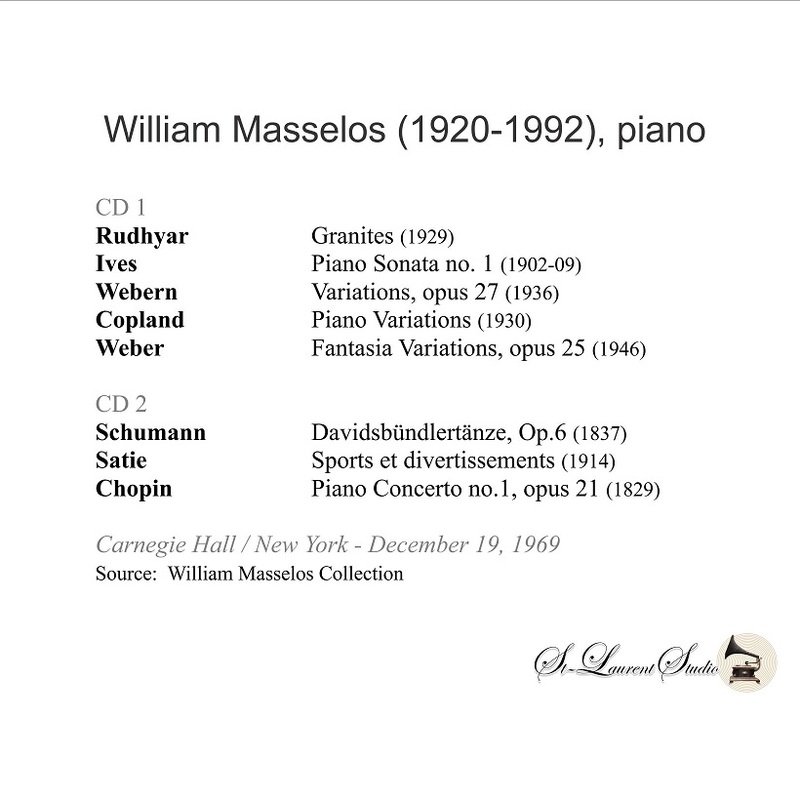 WILLIAM MASSELOS: Granites (Dane Rudhyar), Sonata #1 (Charles Ives), Variations, Op.27 (Anton Webern), Piano Variations (Aaron Copland), Fantasia Variations (Ben Weber), Davidsbündlertänze (Schumann); w.VIRGIL THOMSON (narrator): Sports et divertissements (Satie); w.MAX WILCOX Cond. 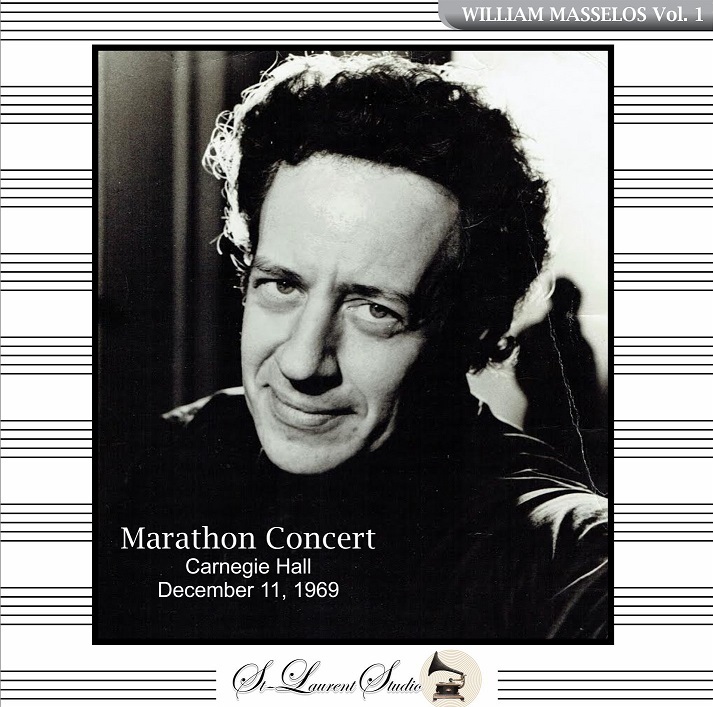 : Concerto #2 in f (Chopin); Spoken Critique on this marathon recital by Harold C. Schonberg. (Canada) 2-St Laurent Studio YSL T-293, Live Performance, 11 Dec., 1969, Carnegie Hall - [In the Carnegie Hall acoustic, this has an absolutely glorious sound quality! Never previously issued.] Transfers by Yves St Laurent. "This mammoth recital (well over two hours of actual playing time) demonstrates unquestionably that William Masselos was one of America's great pianists, and at the same time demonstrates at least in part what may have kept him from achieving the fame that some of his colleagues (Cliburn, Graffman, Fleisher, for example) did. He insisted on acting as if the repertoire of the 20th century was actually part of the canon, worthy of being programmed alongside that of the 18th and 19th centuries - you have the makings of a career more likely to appeal to the cognoscenti than the broader public. Masselos was born in 1920 and died in 1992. His main teacher was Carl Friedburg, a pupil of Clara Schumann, and he was thus steeped in the German tradition, but advocacy for new music was a huge part of his artistry and career. This Carnegie Hall concert might serve as a symbol of his approach. With three intermissions it must have lasted well over three hours, a test of endurance for most listeners (except dedicated Wagnerians, of course). Listeners were invited to come and go as they pleased, to enjoy or avoid the music of their choice! The advantage of a recording is that we don't have to listen to it in one gulp, though I did once through in order to experience the impact of the whole. It was an overwhelming and extremely gratifying experience. It might be fair to say that Masselos plays new music as if it were old music, and vice versa. He gave the premiere of the Ives Sonata (40 years after it was composed), and by the time of this concert had been playing it for 20 years, and thus was completely inside it. He recorded the Ives Sonata twice, once in 1950 for Columbia shortly after giving the premiere, and a second time for RCA in 1967, two years before this recital performance. Even Dane Rudhyar's GRANITES, a work very rarely played, comes across here with a natural ebb and flow. In all of the 20th century works, knotty though they are, Masselos transcends the performance style found in many 'modern music specialists', playing not only with the expected rhythmic precision and textural clarity, but also with grace, elegance, and warmth. He brings to these performances a delicacy in those moments when the music wants it that is often missing in performances of music of this nature. He also commands a very wide coloristic range, again something not always found in the playing those who specialize in music of the 20th and, now, 21st centuries. One stunning example of Masselos' keyboard mastery is the fourth movement of the Ives, marked: 'Allegro, a study in Rag for 5s, 3s and 2s together - presto, as fast as possible'. The movement title says it all. Masselos' clarification of the cross-rhythms is perfect. This movement can sound, in other hands, disjointed and hectic. Here it has shape and direction, rhythmic propulsion without chaos, and manages at the same time to sound spontaneous and completely alive. Every note is given its proper weight, and that is all the more impressive given that we are listening to an unedited live performance. Masselos also made two commercial recordings of Copland's Piano Variations, and he was a close colleague of the composer (he gave the world premiere of the Piano Fantasy). Again, Masselos finds the beauty and lyricism that is an important component of this music, while not minimizing its thorniness or its hard edges. He balances those elements perfectly, and there is just a tad more propulsion and impulsiveness here than in the Columbia recording (I don't have his RCA). When we get to Schumann's DAVIDSBÜNDLERTÄNZE, we hear that same freshness of approach and thoroughness of understanding. The opening sections, 'Lebhaft' and 'Innig', are marked by beauty of tone and a pearly touch. The tonal beauty throughout is a very special component of his playing, which is distinguished by his use of all dynamics, not just soft, medium, loud, and very loud. He displays infinite degrees and subtle differences of piano and mezzo piano, and nowhere is it more apparent than in the Schumann. Masselos encompasses everything in this suite - warmth, charm, humor, exultation, impetuosity, beauty, and earthiness. And he stitches it all together with remarkable unity. The sheer beauty of his playing is the next-to-last section, 'Wie aus der Ferne', will melt your heart. Masselos employs a subtle rubato along with a seamless legato. Satie's SPORTS ET DIVERTISSEMENTS is the least successful part of this recording, through no fault of Masselos or Satie. These are pieces for piano and narrator, and Virgil Thomson is an effective and witty narrator, but unfortunately is miked distantly, thus swimming in an echoey mist that makes him hard to understand. Again, Masselos' range of color is a real asset to the performance. The Chopin Concerto is accompanied by a more than acceptable pickup orchestra conducted by famed RCA producer Max Wilcox. I wonder if Wilcox is responsible for the professional quality of the recording - obviously he must have had a relationship with the pianist. Masselos' playing is as has been throughout the marathon concert: rhythmically precise and solid, imaginatively phrased and shaped, and highly nuanced. The Larghetto may not quite rival Josef Hofmann in its freedom, but Masselos does employ substantial and very subtle rubato while always keeping the forward flow. The release includes a brief (1:34) and enthusiastic review of the concert given by New York Times critic Harold Schonberg, apparently on some radio station. The sound quality is superb, frankly studio-recording quality. Yves St. Laurent provides no notes or documentation of its source, but it certainly gives the impression of being a professionally-made recording with a warm, full, natural piano sound. Norbeck, Peters, and Ford (www.norpete.com), which sells this label, indicates that the recording came from Masselos' own collection. Yves St. Laurent is a company dedicated to finding performances that really merit public exposure and preservation, and to doing it with the highest possible audio quality. They accomplish this successfully, and in this case have made available a truly remarkable piano recital by a very great artist who never achieved the exposure his talent merited." "In musical circles, Mr. Masselos was one of the most respected pianists of his time. He played the premiere performances of Charles Ives' Piano Sonata #1 (in 1949, 40 years after it was written) and of Aaron Copland's most ambitious work for keyboard, Piano Fantasy (1957). He commissioned and played the premiere performance of Ben Weber's Piano Concerto (1961). He was a pianist admired for his incisive, individual performances of contemporary and American music. Mr. Masselos also played, penetratingly, music by composers as divergent as Brahms, Schumann, Griffes and Satie. Because he felt that concertgoing had become ritualized, he experimented with programs of unusual length and scope. In 1969, for example, he offered a three-and-a-half-hour concert at Carnegie Hall [above] that included works by Dane Rudhyar, Ives, Webern, Copland, Ben Weber, Schumann, Satie and Chopin, punctuated with four intermissions. The audience was invited to come and go as it pleased, to enjoy or avoid the musical schools of their choice. 'He always was one of the better American pianists', Harold C. Schonberg wrote in THE NEW YORK TIMES after Mr. Masselos' marathon concert. 'Now he has developed into a great one. He plays in a rather unostentatious manner, and that may count against him on the circuit, where pianists put on a big show. But he has everything. To look over some of the virtues: tone, technique, musicianship, style, imagination, sensitivity. That will do for a start'. William Masselos was born in Niagara Falls, N.Y., on 11 Aug., 1920. He studied at the Juilliard School, where his principal teacher was Carl Friedberg. He made his debut in 1939. He was a regular participant in the WNYC American Music Festivals from 1946 through the mid-50's. He made his debut with the New York Philharmonic in 1952, playing the Brahms Concerto in d minor under the direction of Dimitri Mitropoulos. He worked with many conductors, among them Pierre Monteux and Leonard Bernstein. Although many thought of Mr. Masselos as a new-music specialist, he never eschewed the classics; 'I approach modern music in exactly the same way I approach Brahms or Schumann or Chopin', he said in 1971. 'Of course, new music is always a discovery, a new journey. When I prepare a new score by, say, Copland or Ben Weber or William Mayer, I begin by sight-reading it. It's like taking your first walk in a forest path, and you're very aware and alert, because it's a first, and it's a fresh experience. Then, little by little, things fall into place, and suddenly you know where you are; things become familiar'." "Reviewer Harris Goldsmith described the [above] marathon as being 'of heavenly length', and his review continued: 'Until his recent Carnegie Hall triumph, greeted by a chorus of kudos from both critics and audience, Masselos could have been described as dwelling in a self-imposed exile from a fame easily within his reach. As his performance of the Chopin Concerto at the concert's end clearly showed, he could have followed the path of the Cliburns, the Brownings, or the Ashkenazys through the potboilers of Liszt, Tchaikovsky, and Rachmaninoff in order to court public adulation. He has more than enough tone, technique, and flair to have gone that route, and to have come out, indeed at the summit. Only an artistic conscience that would not be denied has kept him to his lonely course as a crusader for the forgotten, the neglected, the strange, and the new'. 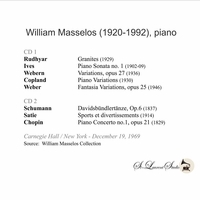 Known as a champion of contemporary music, Masselos has premiered many works including the Charles Ives Piano Sonata #1, the Piano Fantasy by Aaron Copland, most of the piano literature by Ben Weber, including the Concerto for Piano and Orchestra and the Fantasy (Variations), Op.25. He can also be credited with first performances of concertos by Alan Hovhaness, Johan Franco, Marga Richter, Carlos Surinach, and William Mayer, in addition to solo pieces by John Cage, Dane Rudhyar, Robert Helps, Carlos Chavez, and many others."